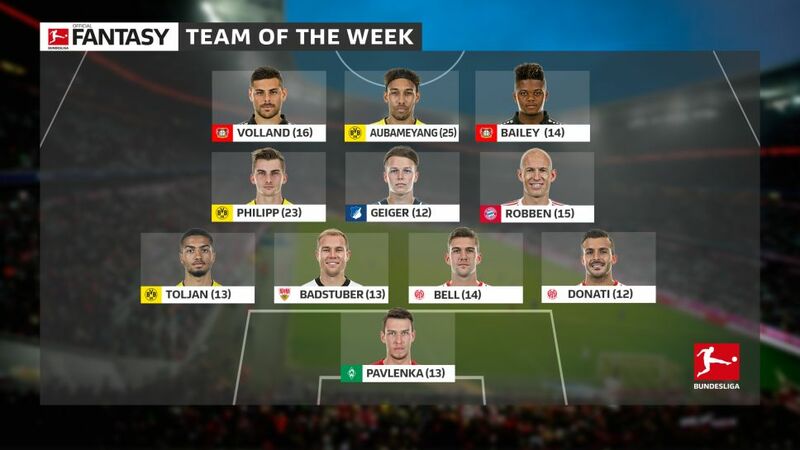 Pierre-Emerick Aubameyang shot to the top of the Bundesliga scoring charts and earned his place in the Official Fantasy Team of the Week with a hat-trick he owed two of his Borussia Dortmund teammates a debt of gratitude for, but who else made it onto the Matchday 6 select XI? Two stunning stops from Florian Niederlechner in the first half of Werder Bremen's 0-0 draw with Freiburg ensured the Northern club were still in the game for the second 45 minutes, while his late stop from Nils Petersen secured his side a point. It may have been a disappointing night for Bayern, but one player who was not necessarily drowning his sorrows on a visit to the Oktoberfest on Saturday was Robben, who underlined once again how important he is to the record champions and Fantasy coaches with shots on tap and an almost customary goal taking him one short of becoming Bayern's all-time top foreign goalscorer outright. The man whose name translates as violinist played a sublime symphony in the Hoffenheim midfield, with just one pass in the entire opening 45 minutes failing to find its intended target. Oh, and the 19-year-old also opened his Bundesliga goalscoring account in a win which took the Sinsheim club to second. With four goals in three games, Dortmund appear to have hit the jackpot with summer signing Maximilian Philipp. His two goals and one assist on Matchday 6 helped the Westphalians move two points clear at the top of the Bundesliga, while his understanding with Aubameyang shows plenty of promise following the departure of Ousmane Dembele. His first two assists in the Bundesliga crowned his first 90-minute outing, and he was not done there either. The Jamaican deserved a goal for his "outrageous" efforts – according to the man himself. And then there were eight… The Gabon forward's hat-trick was another reply to Bayern Munich's Robert Lewandowski, who is threatening to win back the top-scorer's prize this season. Aubameyang has scored in five of Dortmund's six games this season, while he also set up Philipp for extra bonus points. Watch: Aubameyang says the race to be the top scorer is on! Leverkusen had the quality of Kai Havertz, Karim Bellarabi and Julian Brandt all on the bench on Sunday, and Kevin Volland showed with his two clinically-taken goals exactly why Die Werkself can afford to leave such talent on the bench. The 25-year-old is now up to four goals this campaign.